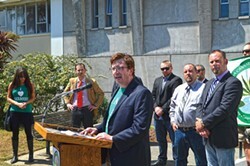 Luke Bruner speaks at CCVH's June 30 unveiling of its ordinance. Through months of discussion and seven drafts of a proposed marijuana cultivation ordinance, California Cannabis Voice Humboldt has promised that a revenue generating proposal was coming. In a July 7 presentation to the Humboldt County Board of Supervisors, the political action committee delivered, presenting the board with a draft excise tax initiative it says could generate millions for county coffers. A week earlier, CCVH members stood on the courthouse steps and triumphantly announced the release of the final draft of the group's proposed land use ordinance to govern grows on parcels larger than 5 acres ("Draft Day," July 2). The ordinance would principally permit existing grows with canopies of up to 10,000 square feet, while requiring conditional use permits for new operations or larger ones, and would put all commercial grows under the purview of the county agricultural commissioner, which would require annual inspections and proof of a variety of licenses from state agencies. Bruner presented the basics of the draft to the board but also unveiled the group's revenue-generating proposal, which would have growers pay the county an excise tax of 50 cents per square foot on growing operations with canopies between 600 and 6,000 square feet and $1 per square foot on larger grows. Operations with canopies smaller than 600 square feet wouldn't be taxed, and canopies would be measured at their largest point in the year. How much revenue this proposal would actually generate amounts to guesswork, but Bruner proffered it could fetch the county $8 million to $10 million in the first year. Data quantifying the number and scale of marijuana cultivation operations within Humboldt County is hard to come by. In 2012, the Humboldt County Sheriff's Office spent some time with Google Earth and identified more than 4,100 outdoor marijuana gardens in the county, but officials say the numbers have increased substantially since. In his presentation, Bruner estimated the number to be between 8,000 and 10,000. Last year, a study by environmental scientists at the California Department of Fish and Wildlife looked at grow operations in several local watersheds and estimated the average canopy size to be about 2,300 square feet. If we use the DFW numbers as an average, the excise tax proposal could generate $4.7 million in revenue for the county, based on the Sheriff's Office's 2012 numbers. If we use Bruner's 8,000 figure, the revenue could jump to $9.2 million. But, that's assuming the 2,300-square-feet average holds true across the county and — perhaps more of a stretch — that all growers jump on the tax bandwagon. The proposed tax ordinance designates the county agricultural commissioner as the "tax administrator," meaning he or she would be responsible for both assessing the taxes and collecting them (they'd be due July 1 of every year), as well as taking enforcement actions when necessary. On the surface, this appears to be a massive undertaking for the county agricultural commissioner's office, which currently has a staff of six, yet would be tasked with certifying, inspecting, overseeing, assessing and taxing all the county's cannabis farms. Agriculture Commissioner Jeff Dolf has repeatedly declined to comment on the proposed ordinance and did not immediately return calls seeking comment for this story. During his presentation, Bruner mentioned in passing that a cannabis farmer could reasonably expect to harvest between three and five pounds of processed marijuana for every 100 square feet of canopy, which would mean a grow with a 10,000-square-foot canopy could reasonably generate 400 pounds of market-ready marijuana bud. If sold for $2,000 a pound, that would generate about $800,000 in gross revenue with a tax bill of $10,000, or 1.25 percent. Using the same method, the grower with a 2,300-square-foot canopy could expect to yield about 92 pounds, which could fetch about $184,000 on the market with a tax bill of $1,150, or 0.6 percent. Of course, theoretically, newly licensed and legitimized growers would also be paying sales and income taxes, generating additional state and local revenue. But many think the revenue conversation is putting the cart before the horse, and during public comment after Bruner's presentation, former Humboldt Area Foundation Executive Director Peter Pennekamp accused CCVH of "immorally" telling the county to "get on the money train" while ignoring the environmental and social devastation brought by the local marijuana industry. The comments of Pennekamp and others at the meeting seem to underscore a philosophical divide in this regulation conversation. During his presentation, Bruner made very clear that CCVH's ordinance is designed to prompt voluntary compliance from the growing industry. The idea is it gives growers a chance to legitimize and survive on a changing landscape as California likely enters the post-legalization world. Bruner said he will consider the ordinance successful if it brings 5 percent of county growers into the fold in its first year. "If 500 people come in, I think we'll be successful," Bruner said, adding that he thinks market forces will then push more people toward compliance as growers following the rules become less tolerant of those who are skirting them, viewing them as "unfair, illegal competition." But many in the environmental community feel that a county ordinance should first and foremost seek to rein in existing grows, in part through additional enforcement. 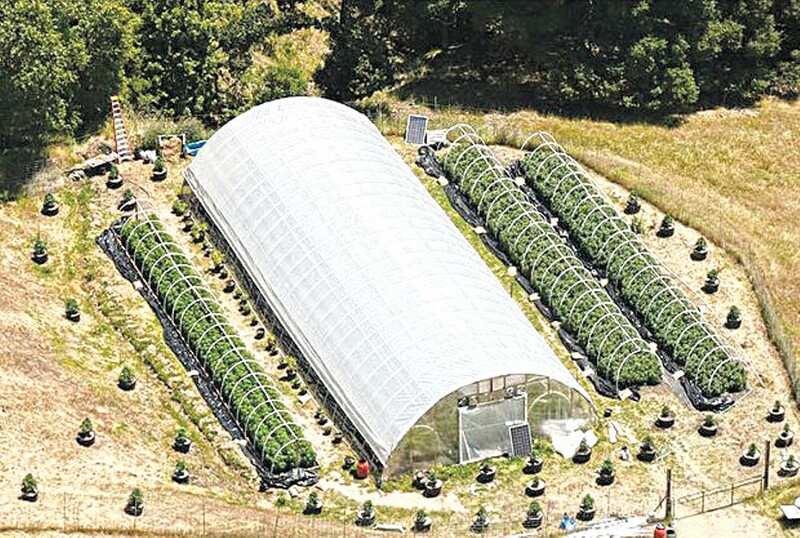 Legitimizing Humboldt's existing growing operations while bringing the top 5 percent of growers into compliance won't do anything to cure the environmental crisis going on in the hills, they say. "To have an industry that is trying to legitimize large-scale operations — it's entirely irresponsible," Northcoast Environmental Center Executive Director Dan Ehresman said. Ehresman's comment underscores another huge divide in the conversation — canopy size. Many in environmental groups say a 10,000-square-foot canopy is huge, while Bruner refers to it as a "mom and pop" operation or a "micro-farm," noting, "10,000 really isn't that big. There's giants out there." With its July 7 presentation, CCVH kicked off a 45-day public comment period during which people can review the ordinance on CCVH's website (www.ccvhumboldt.org) and submit feedback. After the comment period, CCVH plans on incorporating comments into a final version before launching an ordinance initiative process in which it would have to gather signatures from about 7,400 registered voters in support of the ordinance to put it before the board, which could then adopt it as written or send it to county voters in November. Bruner said on July 7 that CCVH would welcome the board's launching a parallel process, taking CCVH's work to date and building on it. But that idea seemed to get no traction on the board. Supervisor Mark Lovelace made a motion asking the board to query county department heads for input on the draft ordinance, but his colleagues unanimously felt that unnecessary, saying department heads would weigh in as they see fit and the board would see where the process lands in 45 days. Meanwhile, Supervisors Ryan Sundberg and Estelle Fennell continue to work both with CCVH and on a proposed ordinance of their own, the details of which haven't been made public. CCVH is a private political group, not a public agency, so there's nothing forcing it to make public the comments it receives on the draft ordinance. But Supervisor Virginia Bass asked that the group opt to do so, and Bruner said he'd forward that request on to the person in charge of the group's website. For his part, Supervisor Rex Bohn made clear he's not ready to hitch the county's wagon to what CCVH has proposed. "I think you've got a long, long way to go," he said, though he quickly echoed the comments of some colleagues and members of the public thanking CCVH for jump starting a dialogue on the issue. "You guys jumped into the water to see how deep it is ... Right, wrong or indifferent, it's started a conversation."